Check out this video by Newlink America featuring Dr. Felipe Korzenny of F.S.U. 's Center for Hispanic Marketing Communication. Interested in exploring the best model to connect with Latinos? 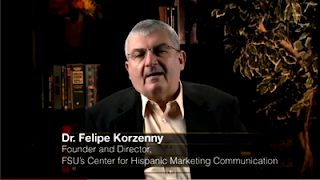 Newlink Conversations: Dialogue, Debate and Discovery, video commentary on topics that matter in the U.S. Hispanic, market just posted their latest vlog on the use of Spanish versus English to reach Hispanics featuring Dr. Felipe Korzenny, Founder and Director of the Center for Hispanic Marketing Communication at Florida State University and co-author with Betty Ann Korzenny of a new book: Hispanic Marketing: Connecting with the New Latino Consumer. In the vlog, available at www.youtube.com/newlinkamerica, Dr. Korzenny shares his research-based insights on what marketers need to understand when deciding whether to use Spanish vs. English to reach Hispanics. He also vlogs about when it is appropriate to consider a mix of both Spanish and English language when advertising to Hispanics. “Dr. Korzenny’s research and perspective on this and other topics is valuable to experienced and nascent marketers who are always debating and exploring the best model to connect with Latinos,” said Jorge Ortega, Managing Partner of Newlink America.